These little cuties live in the dense forests of West Africa. They are nocturnal and an extremely shy antelope species. If disturbed they are said to be able to leap 2.5 meters in one bound! The Royal Antelope can grow up to be a whopping 10 to 12 inches tall with a weight of about 10lbs! Get out the foot rule and weight scale, folks! Watch video of an adorable royal antelope at the San Diego Zoo. The hog nosed bat (aka the Bumblebee Bat) lives in Thailand and it's as tiny as a bee and just as fuzzy! Tourists disturbing roosting bats have led to their decline and now have made them vulnerable to extinction! The weight of the Bumblebee Bat is less than 2 grams and that would be the weight of a coin, specifically a dime! Please don't swat at it though... It's a mammal not an insect! The Bee hummingbird is the tiniest of all birds and is native to Cuba. This species of hummingbird weighs around around 1.6–2 g (0.056–0.071 oz) and has a length of 5–6 cm (2.0–2.4 in.). Like the Bumblebee Bat, the bee hummingbird weighs about the same as a dime! They can flap their wings over 100x per minute and they lay the smallest eggs in the world in a 2.5 cm (1 inch) diameter cup-shaped nest! Discovered in 2009, the Paedophryne Amauensis Frog (pictured above atop a dime! 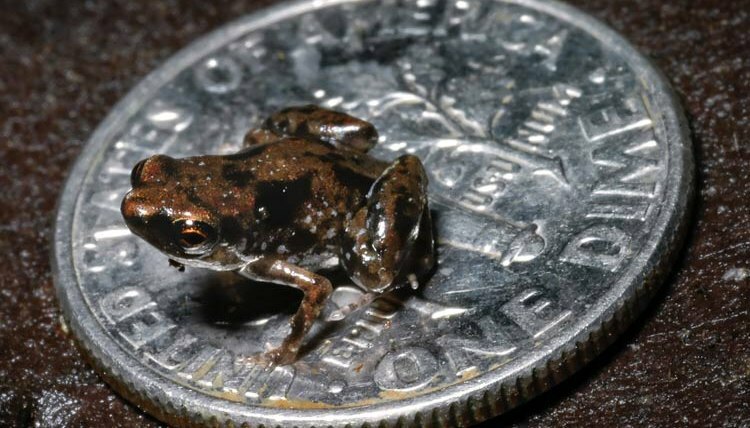 ), found in Papua New Guinea is the world's smallest known vertebrate, measuring in at 7.7 mm (0.30 in) in length. They live in rainforest leaf litter and they're smaller than a coin! The Brazilian Gold Frog (Brachycephalus didactylus) also known as Izecksohn's toad, is the second smallest frog with adults measuring to a mere 9.6–9.8 mm (0.38–0.39 in) in body length. Their beautiful golden color explains their common name. The third-smallest frog in the world (from Cuba) is the endangered Monte Iberia Eleuth (Eleutherodactylus iberia). It measures about 10 mm (0.39 in) in snout–vent length. What has an average length of 29 mm (1.1 in) and has enough room to stand on your fingertip with plenty of room to spare? Why the Brookesia Micra Chameleon of course! Small enough to stand on a match head, this smallest chameleon species from Madagascar faces extinction due to excessive logging in Madagascar’s forests. The Dwarf Gecko, found on the British Virgin Islands is even smaller than the Micra Chameleon, and measures about 18mm (0.71 in) from its snout to its vent. Nearly as small as a dime, the most it's weighs is 0.15 g (0.0053 oz). The tail will regenerate when broken off but little is known of its biology or population size. In South Africa you'll find the smallest tortoise in the world. This tiny tortoise can grow up to 8-10cm in length and can weigh about 95–165 grams (3.4–5.8 oz). Unfortunately, this turtle has been inadequately protected. As a pet, the speckled padloper is not the easiest of pets to care for, even though this species adapts best to captivity. Satomi's pygmy seahorse, found at the Derawan Islands off Kalimantan, is the smallest known seahorse in the world! With an average length of 13.8 millimetres (0.54 in) and a height of 11.5 millimetres (0.45 in) this tiny seahorse has been purported to be one of the hardest species to find, making it almost impossible to photograph! This seahorse is nocturnal and more active than any other Pygmy species. From Seahorses to the American miniature horse which is around 34 inches (86 centimeters) tall at the withers (the ridge between the shoulder blades), according to the International Museum of the Horse. These horses were Initially bred for European nobility in the 17th century. Nowadays miniature horses are used for guide and therapy animals for the blind and disabled. Guide horses can be calmer than dogs after training because of their docile nature. This smallest breed of cattle in the world grows to be 87cm in height and 124cm in length. This small cow is known for producing vast quantities of milk without requiring a lot to feed. The milk is believed to have medicinal properties and more of the beta carotene A2 rather than A1 which has been implicated in conditions such as diabetes, heart disease and autism. Known to be the smallest land mammal in the world by mass. (The bumblebee bat is regarded as the smallest mammal by skull size). The shrew weighs in at about 1.8 grams (0.063 oz) and is also known as the Savi’s pygmy shrew. The shrew is found throughout Eurasia and even Africa. They have an extremely fast heartbeat meaning they need to eat a lot of worms! This tiny jellyfish measures 1 cubic cm (1cm3) in size (that's smaller than a human fingernail) but it's venom packs quite a wallop and left untreated can cause death! This tiny box jellyfish inhabits the marine waters of Australia and are capable of firing stingers into their victim. There are five known species of iIrukandji: Carukia barnesi, Malo kingi and discovered recently, the Malo maximus, Malo filipina and Malo bella. Think of an elephant, then think 30% smaller than an Asian elephant and you'll see an elephant where the male grows to just 5 to 8 ft tall, whereas the females are 4 to 7 ft in height. Since 1986 the Pygmy Elephant has been listed as endangered, due to habitat loss, degradation and fragmentation (driven by the expanding human population.) Their genetic distinctiveness makes them one of the highest priority populations for Asian elephant conservation. In Malaysia, any person found guilty of hunting elephants is liable on conviction to large fines or five years imprisonment or both! Also known as the Blue Penguin or Fairy Penguin is found in New Zealand and Australia and is considered to be the smallest species of penguin. This penguin grows to an average of 33 cm (13 in) in height and 43 cm (17 in) in length. Measurements vary through the subspecies. Like all penguins, their little wings have developed into flippers for swimming. Their head and upper areas are blue in color with a slate gray to white underneath. Their flippers are also blue. These seabirds, like most, have a long lifespan. They live on average 6.5 years, but some very exceptional cases have lived up to 25 years in captivity. This owl is from Mexico and is one of the smallest owls in the world, growing to about 13.5cm (5.3 in.) long. It's natural habitat is tropical or subtropical forests. The Tamaulipas Pygmy Owl, partly diurnal bird, feeds on insects, lizards and other small animals, but little else is known about the owls habits. He's small and cute (almost looks like a 'Muppet') and is found in the thick forests of Central and South America. Including the 25cm long tail, this anteater is just 35cm, making it the smallest anteater on Earth! This hard to spot mammal is dedicated to staying in the trees and is basically nocturnal. The Pygmy anteater fasten themselves to trees to feed with their two curved claws while utilizing their prehensile tail for added support. They also use their claws for defense against predators. They usually keep themselves out of sight in daytime by curling themselves up into a perfect ball in the trees. Watch video of adorable pygmy anteaters in action! I can't even imagine a shark small enough to hold in the palm of your hand but this one's maximum known length is 21.2 cm or 8.3 in. This shark lives in very deep water—about 928 to 1,440 feet (283 to 439 meters)—off the coast of Colombia and Venezuela. Like other members of its genus, this shark is capable of producing light from its photophores. This is the smallest member of the blind thread snake species found on the Caribbean islands of Barbados. It's about as thick as a spaghetti noodle. The snake's average length is approximately 10 cm, (3.9 inches). The largest specimen found to date measured 10.4 cm (4.09 inches). The Threadsnake is thought to feed on a diet of termites and ant larvae. As my list of miniature animals comes to an end, please note that there are many more diminutive animals in nature not mentioned here. Why not research how many more you can discover for yourself on the NET. As for me, I'm spent from of all this "small" talk!